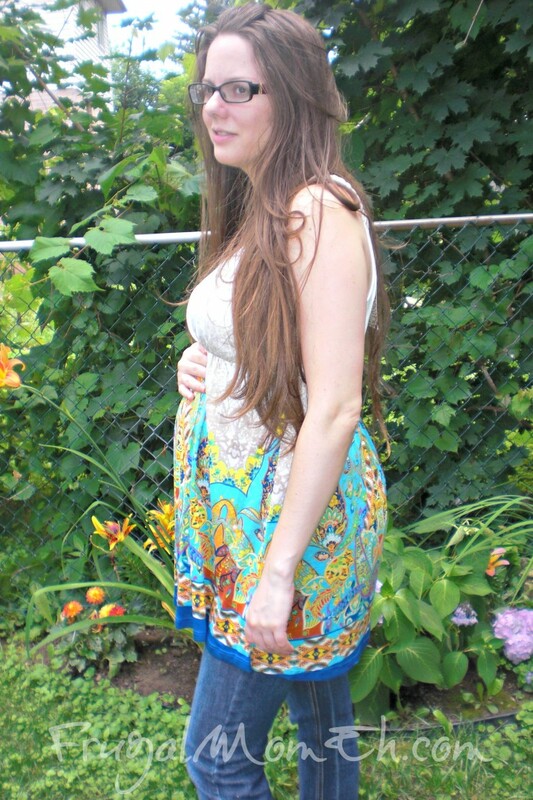 PinkBlush Maternity Review & Giveaway - Frugal Mom Eh! When I was pregnant with Keira I had a pretty extensive maternity wardrobe – I had to because I was working full time professionally and needed comfortable clothing to wear at work as well as clothing for at home. At the time I thought I had only one choice when it came to building a wardrobe to take me through my pregnancy and it was expensive. Not only did the cost throw me back but also the almost complete lack of style available. Don’t get me wrong, it was all well made and served its purpose but it seemed utilitarian compared to my usual wardrobe. Suffice to say, I was bored of my maternity clothes before I even hit 20 weeks. Only after my daughter was born did I hear about PinkBlush Maternity and had the chance to browse through the trendy maternity clothes they have to offer. Now that I am pregnant again with baby #2 I was really happy to review an item from their collection. PinkBlush Maternity offers trendy, cute, and affordable maternity clothing. I chose to review their Multi-Colored Print Maternity/Nursing Tank which features a colourful Indian inspired print with twisted rope straps. I loved the bright pattern of the shirt and knew it would work well as maternity clothes but that it would also fit really well into my usual wardrobe after the baby is born. The fact that it can also be used while nursing is a huge bonus for me. I did have maternity/nursing shirts with Keira but honestly I never used them for nursing as I was so sick of them when I was pregnant and they were just not flattering once my bump was gone. I love this shirt so much I know it will continue to be worn throughout our nursing journey (and perhaps beyond!). So not only is this a beautiful shirt which will give you lots of wear but its also super comfortable and the material just feels really nice on my skin. Check out PinkBlush Maternity for a wide variety of Trendy Maternity clothing. If you love the Maternity Tank I have reviewed here, it is currently on sale for $18.99/Was:$46.99. One Frugal Mom Eh reader will win a $25.00 gift certificate to PinkBlush Maternity. If you have won a giveaway from PinkBlush Maternity in the past 6 months, or have hosted a giveaway in the past 6 months, you are not eligible to win. Gift Certificate will be e-mailed to the winner once confirmed. Giveaway ends August 23, 2013 at 11:59 pm EST. See Giveaway Tools form for entry and full T&C. Disclosure: Frugal Mom Eh received the above mentioned product in order to facilitate this review. All thoughts and opinions are honest and remain my own. LOVE the Navy Blue Turquoise Print Maternity Maxi Dress and it is on sale for $24.99!!! Love pink blush – have a few pieces from them already that are far superior to some of the more pricey things I picked up early on. Would LOVE the Navy Blue Beige Striped Maternity Cardigan if I win this contest – perfect for layering at the office or a chilly evening and will easily be worn well beyond my days with a bump! The cream floral 3/4 maternity top! GORGE.. thanks for the chance! I would buy Fuchsia White Striped 3/4 Sleeve Maternity Shirt. I like the Pink Cream Striped Knit Maternity Sweater. Fuchsia Chiffon Lace Accent Maternity Blouse is my choice. The Beige Bohemian Maternity Top is really pretty. What a hard choice… I think I’ll go with this one: http://www.pinkblushmaternity.com/p-5648-mocha-bohemian-maternity-top.aspx The Mocha Bohemian top. I’m due in February, so I need to think practically and look at the long sleeved stuff, as my last baby was born in July, and none of my left over mat clothes are warm weather! I don’t have any dresses. My wife likes the Aqua White Chevron Chiffon Bow Maternity Blouse. I would buy the Gold/Beige Knit Maternity Cardigan! I like their cardigans, especially the lace-back! I like the navy mint colorblock top. I would get the Coral White Striped Knit Maternity Cardigan! Loving the Grey Sash Maternity/Nursing Tunic – so cute and easy to wear from summer through fall! I like the jade open sleeve maternity top. I like the navy blue basic maternity tee or the ivory short sleeve maternity shirt. I love pink blush maternity!!! Everything I’ve ordered from here has been my absolute fav thing and can totally see wearing this stuff after the baby comes its so cute and flattering. Wow maternity clothes have come a long way since my last pregnancy thankfully. If I win, I would love to get the mocha knit cardigan. It’s so chilly at my office this would be great!!! Thanks for the chance and awesome review. Loving the basic maternity tees! What super, super cute options! My favorite it Mocha White Striped Maternity Cardigan but it was a tough choice! I’d choose the beige bohemian maternity top. Thanks for hosting! I like the Olive Green Maternity/Nursing Dress. i like the Fuchsia White Striped 3/4 Sleeve Maternity Shirt. I like the basic maternity tee because it’s nice and long. I really, really like the Navy rust striped top. So pretty.